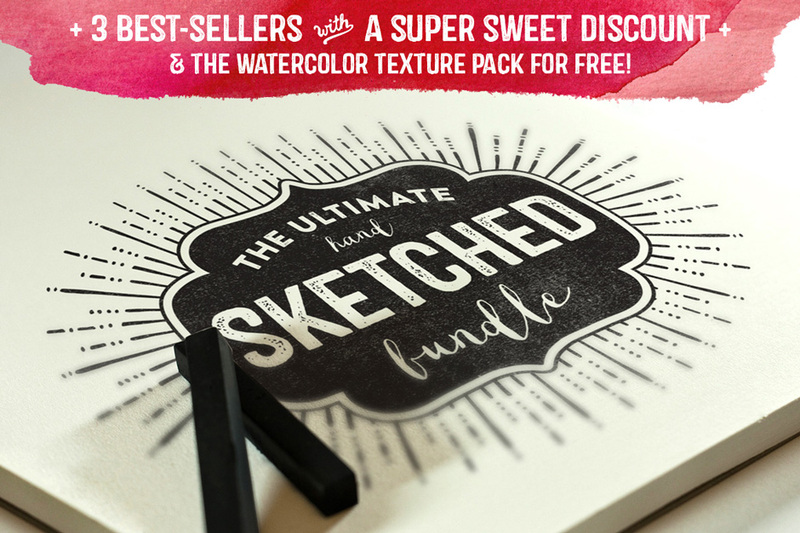 Are you ready for some sketchy goodness at a sweet price…and a totally new bonus product for free!? Well then, you’re in the right place! This bundle is loaded with shapes, brushes, borders, corners, frames, elements, banners, textures (vector and raster) and more! This might be the last hand-sketched product you’ll ever need! Software compatibility: Adobe Illustrator CS4 and newer. .JPG files will work with most graphic software. File size is approx 507.5MB (626.6MB unzipped), offered as a single download. I know the description says the vectors are for Ai only . . . but since they are vectors, shouldn’t they work in CorelDraw too? I need to scale the elements and borders to a large size ( to fit a 12″ x 24″ sign) and am concerned the jpegs will not look good at the larger size. Thanks so much for reaching out to us Mark! Callie, the designer behind this pack has included Ai vector files for these elements, which is why Illustrator has been specified in the compatibility, so my apologies for any confusion caused! The good news is that they have also included EPS files for the Borders, Corners and Bursts and DIY Typography Kit, so I hope that these will be useful for your sign designs. I would be happy for you to purchase this pack and trial it out for 30 days to see if it will be a good fit for you. Hopefully you do find it useful, and if this pack is not quite perfect for your projects, we will happily refund you in full :). Thank you for the fast reply and the “try it for 30 days” offer. I will be purchasing the package – it is exactly what I have been looking for. I know CorelDraw is not as popular as Illustrator, so most people do not think of it when designing. I am curious to see if the vectors elements work with Corel. If not, I do have Illustrator and can open them there. Thanks so much for coming back to me Mark and it makes us so happy to hear that you find our 30 day trial period really useful so that you can ensure that all of your purchases are really useful for your creative projects- it’s always awesome to hear that our community feel that we are doing a good job :). I am so sorry for any confusion caused with this one. The only JPG’s provided are for the watercolor Texture Pack, the rest do all require AI I am afraid. This is also stated in the item description, so my sincerest apologies if you missed this! Software compatibility: Adobe Illustrator CS4 and newer. .JPG files will work with most graphic software. That’s all it said on the what’s included. But the eps or psd of those files. I Know they are missing because I did get the eps and psd of the The D.I.Y. decorative typography starter pack catch words & handmade textures. Please help. I got this for the great graphics on the The Totally Texture hand Drawn Vintage Vector Creation kit 30 shapes, 18 textures,8 backgrounds and 150 elements which is more complete than the The D.I.Y. decorative typography starter pack catch words & handmade textures. I think there is a slight bit of confusion here- In the Totally Texture Vector Creation Kit I can definitely see .AI files for the 30shapes, 12 brushes, 12 textures & 150 elements. The 8 Backgrounds however have been included at JPG’s. The only other JPG’s stated in the product description are for the Watercolor Texture Pack. I did notice though Hilda that there is another folder of 4 JPG textures included in the Totally Texture Vector Creation Kit, so I’ve asked our Product Team to clarify this with the designer. Rest assured, as soon as we have a response I will be back in touch to let you know. Thanks for your help. Awesome Customer Service. I hope this helps, and please do let me know if you have any other questions.